Orca Watcher: August 26 - September 14: Catching Up On Whale Sightings! 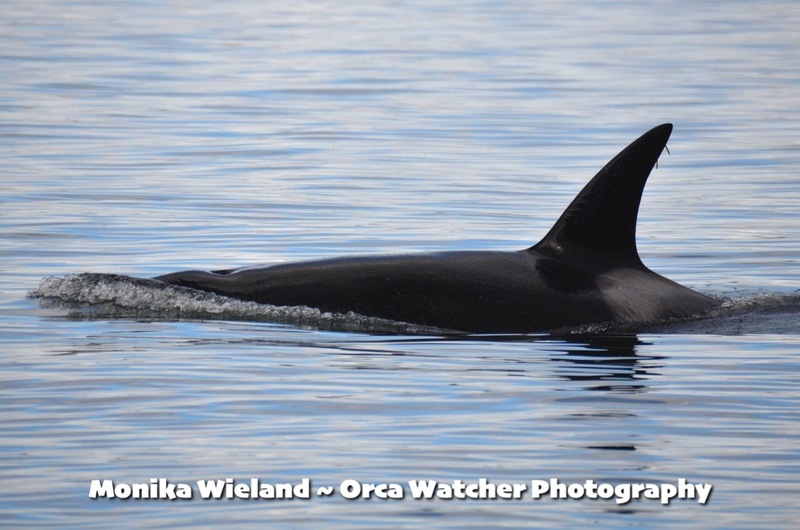 August 26 - September 14: Catching Up On Whale Sightings! 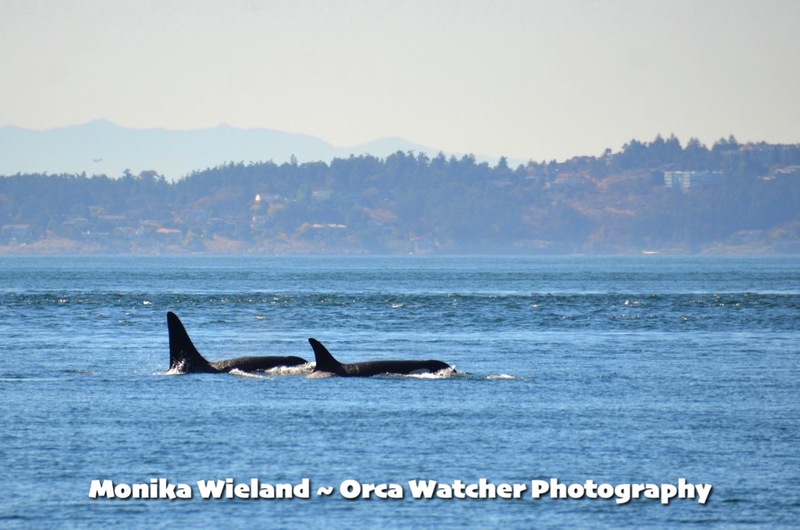 On August 26th, the J17s and J22s spent the afternoon foraging on the west side of San Juan Island. 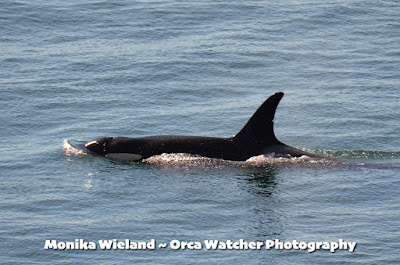 The J17s were off Land Bank, where I got to see every member of the matriline over the course of an hour - including J28 Polaris, who was reported to be looking very thin. 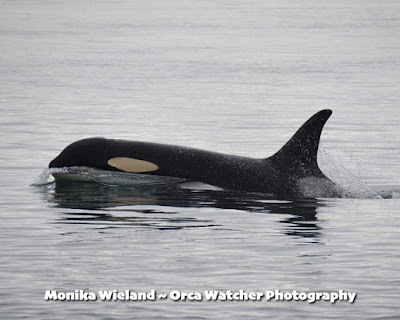 It was hard to see her in this condition, but after concerns that she might be living out her last days, I was very grateful to see her at all! This photo (taken from shore) shows depressions around her blowhole and eyepatches that are signs of a malnourished whale. 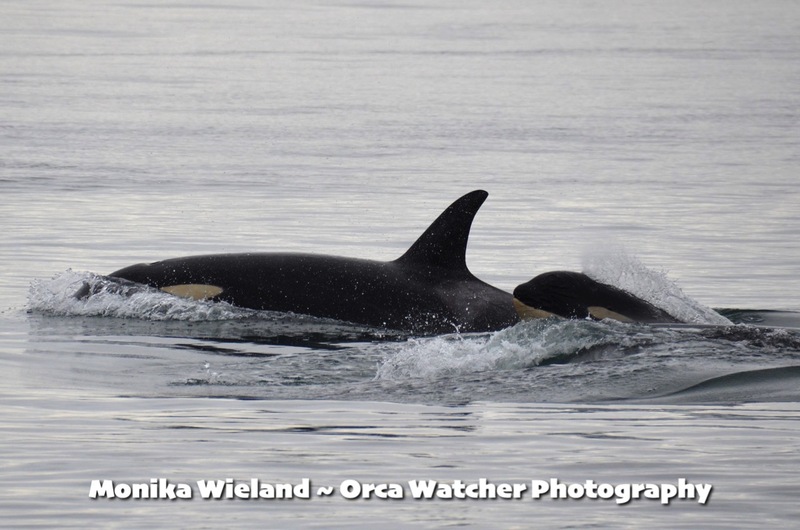 Fast-forwarding ahead for a moment, J28 - as well her dependent calf J54 (just named Dipper) and older daughter J46 - are all still with us. While she still shows a bit of a depression, in my opinion she looks a little more rounded out like perhaps she's been gaining some weight. The fact that she's made it this long after looking in poor health attests to her fighting spirit! We're all still sending her and her little family lots of strong healing energy and love. 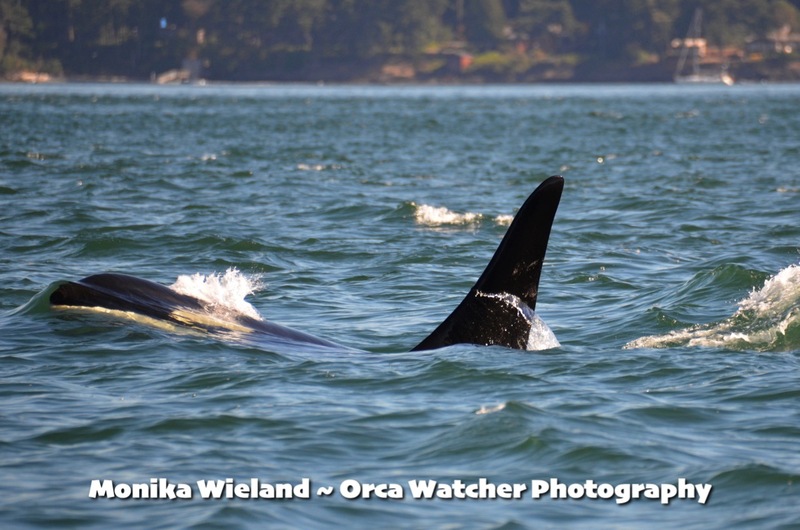 On August 28th, after hearing there were transients nearby, we jumped in the boat to get a glimpse of them near Spieden Island. 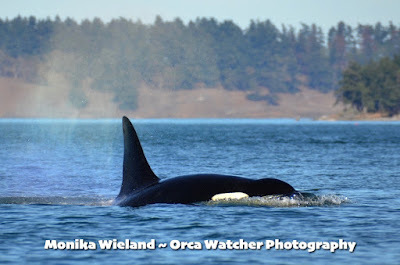 It was the T36s and T99s, and while we were only with them briefly, we caught a little bit of action! 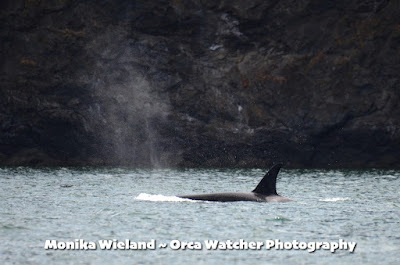 On August 31st, I was thrilled to be able to share a short but sweet pass by some Ks and Ls at Lime Kiln with my visiting family. 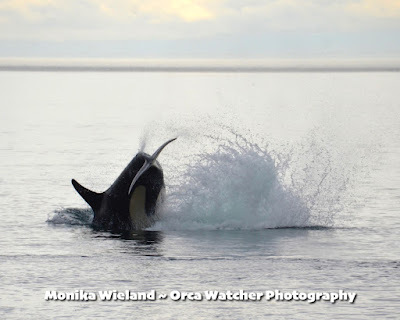 While they seemed to be in travel mode, we got treated to a spectacular cartwheel - I don't think I've ever photographed one from this angle before! On September 2nd Jason and I headed over to Vancouver Island to visit family and take care of some things over there, and amazingly, some whales followed us! 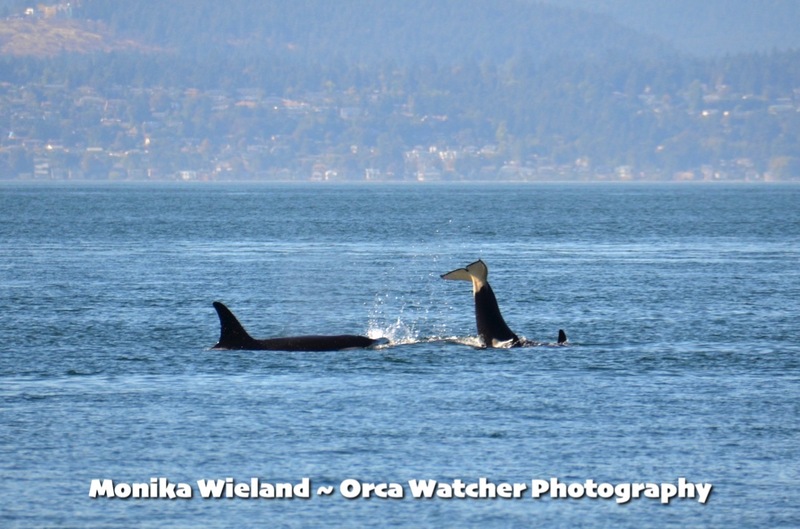 We got lucky to get a glimpse of two transients, T2B and T60D, make their way deep into Saanich Inlet. 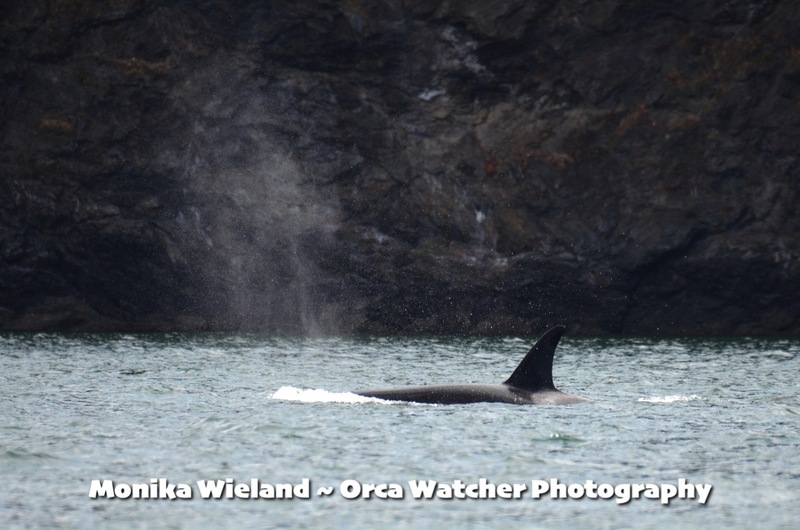 Then, we got even luckier after we traveled around the other side of the inlet and were in the exact right place at the right time to get a close shore-based pass right in Mill Bay! 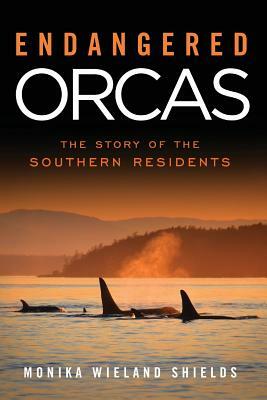 It was extra special to share it with Jason, who grew up going to that beach, but had never even seen orcas before this year. As a result of being away there was then a week gap in whale sightings for me, remedied on September 10th when the Southern Residents came back in. 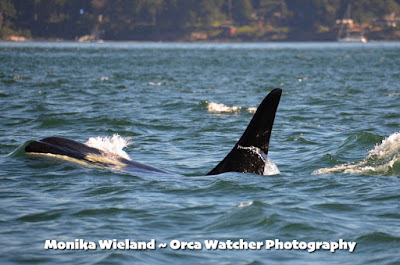 Technically, it was a superpod - with all the Southern Residents here - and not the first such day of the year. But, I feel like I haven't experienced a true superpod yet this year. 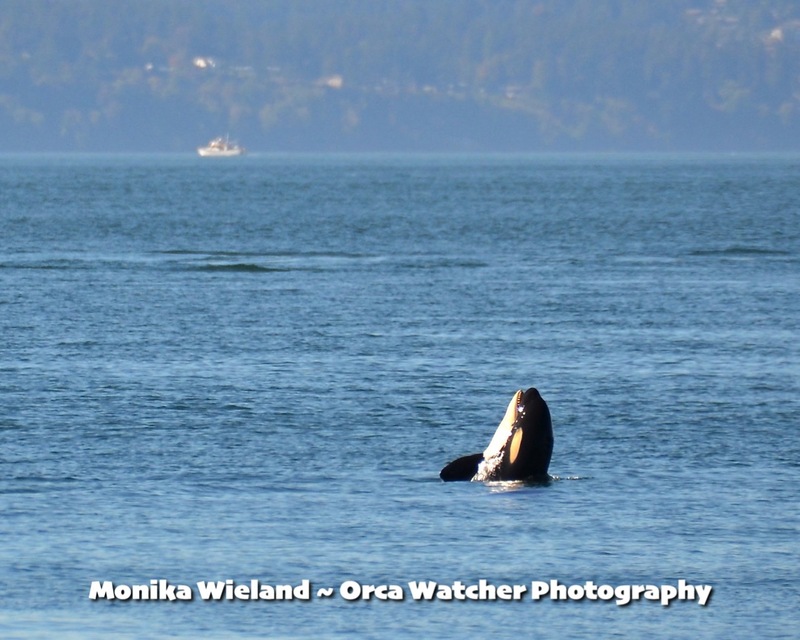 They've all been in inland waters at the same time, but SO incredibly spread out. For instance, on this day, spread from Trial Island to Active Pass! 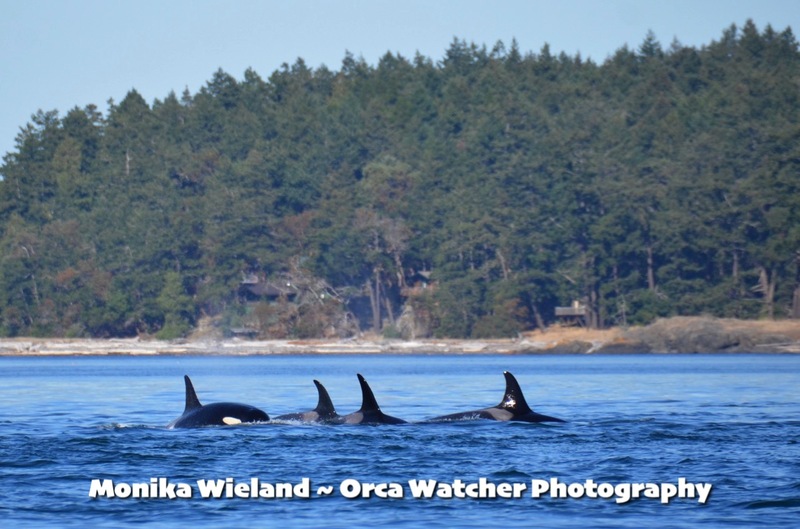 To me, a superpod brings up images of a party scene of 80+ whales in tight, intermingling groups...still waiting for that this year! 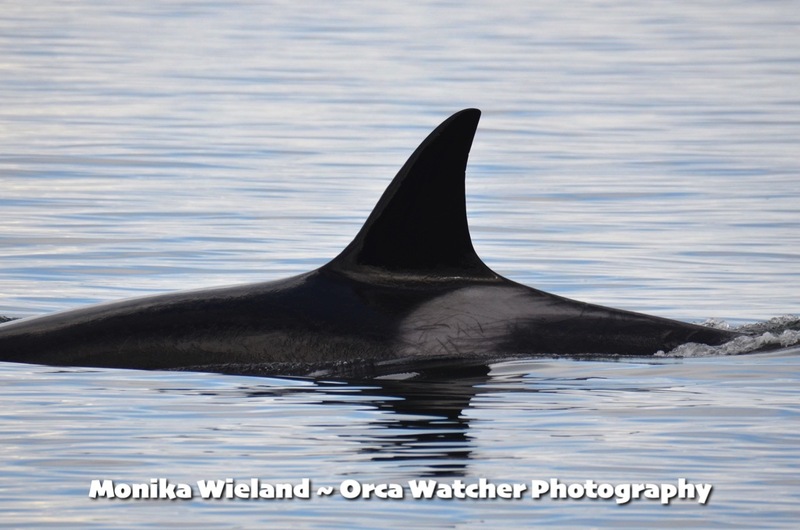 Our September 10th encounter was more indicative of what it's been like this year. Over the course of an hour we saw 7 whales representing members of all three pods, but not even all members of a single matriline and no other fins in sight! 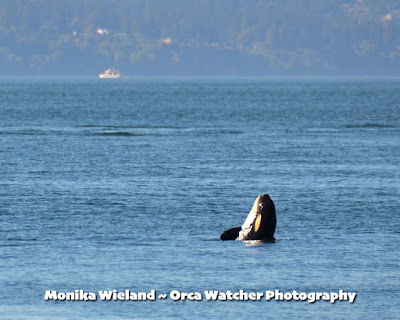 On September 11th we saw a distant pass from Lime Kiln, the most notable moment of which was when a humpback whale came cruising north while the whales traveled south. The humpback, who I identified as BCY0409 Yogi, seemed to take exception to the fish-eating whales, trumpeting on every surfacing. Earlier in the day, some other whale watchers had documented humpback whales interfering on a transient killer whale attach on a Steller sea lion...I couldn't help but wonder if this was one of the same humpbacks, just ticked off at orcas in general that day even though the resident orcas posed no threat to it. 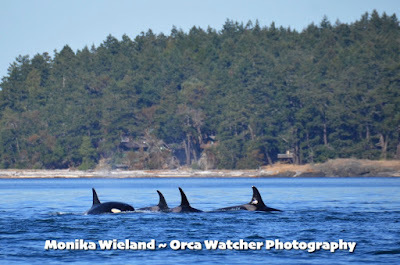 On September 14th we had an occurrence that used to be common but hasn't been so much any more - ALL of J-Pod and ALL of K-Pod traveling together! That really shouldn't be a shock, but it's because a rarity these days. J53, who was just named Kiki, was super active at the surface as she often is, and did several half breaches with her mouth open! It's not too often you get to see orca teeth! As usual, K25 Scoter was right with mom! 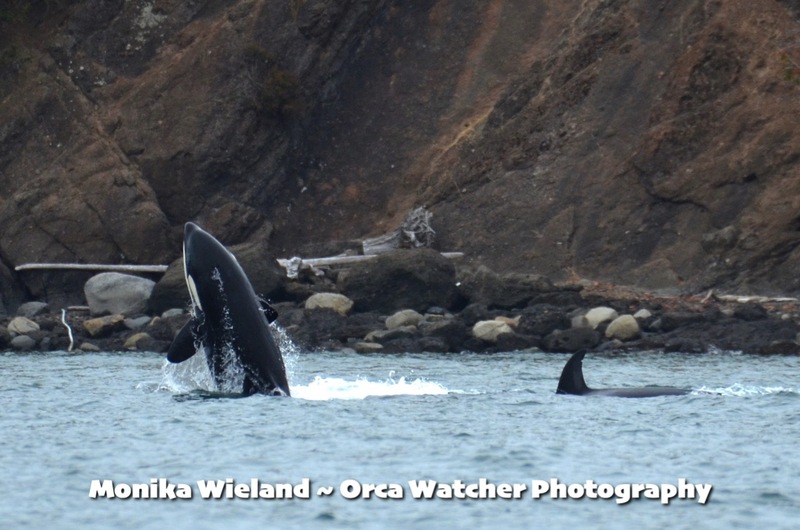 We only caught the second half of the pass at Lime Kiln, but the vocalizations were so great we decided to hop in the boat to see if we could get more recordings further north. Wow, did we ever! Not only were the whales very vocal, but something about the water conditions made the calls really resonate so we could hear everything very clearly even from far away. 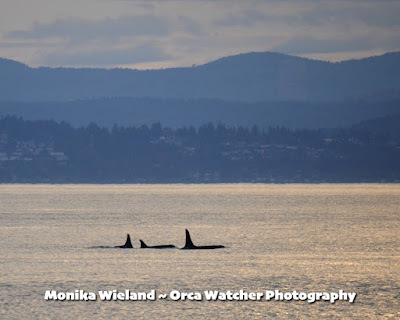 At one point we set up about 1/4 mile off shore from whales foraging along the cliffs at Kellett Bluffs, and recorded for about 20 minutes - quite long for a boat-based recording! 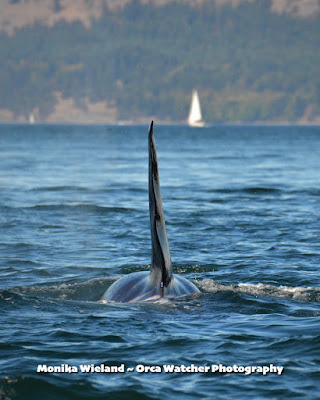 We hardly saw any dorsal fins during that time, as the whales were doing long dives and were pretty far away, but the calls made it sound like at times they were talking right into the hydrophone! Take a listen here for a sample of what we heard. 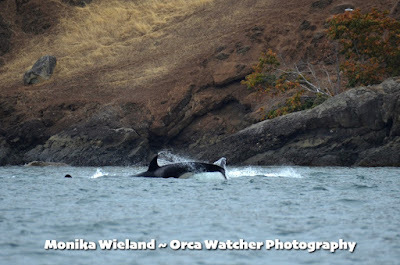 It's been interesting to see such an increase in active foraging behavior over the last couple weeks. 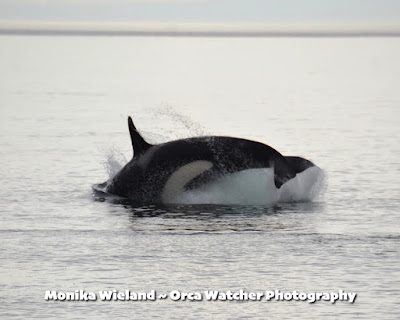 Whales aren't just stopping to opportunistically catch a salmon as they travel, they're hanging out in one area for long periods of time and regularly pursuing fish, apparent from their fast surface lunges. Hopefully that's indicative that they're finding more to eat, though their pattern has pretty much been one day up to the Fraser, one day down, one day out. 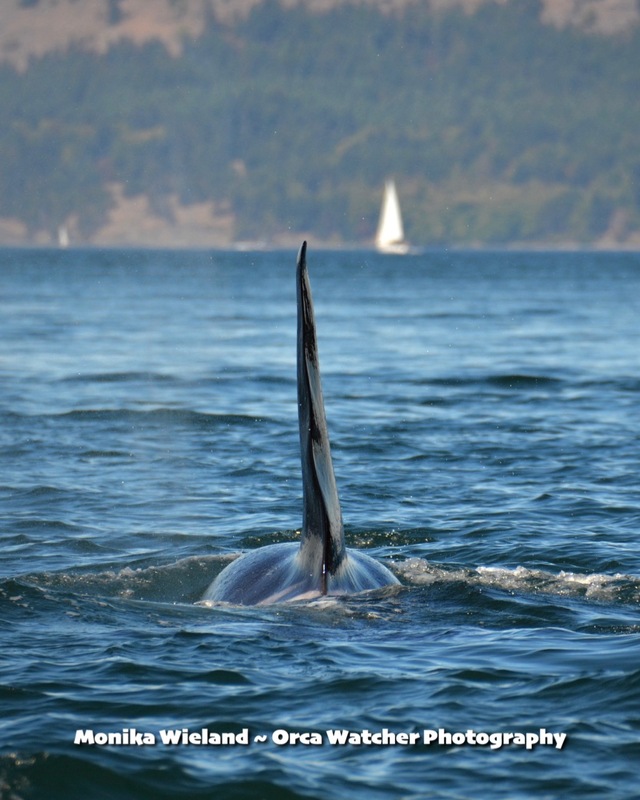 Even though he was far away at this point, I had to crop this photo because I love this perspective so much - the trailing edge of the dorsal fin of L87 Onyx! 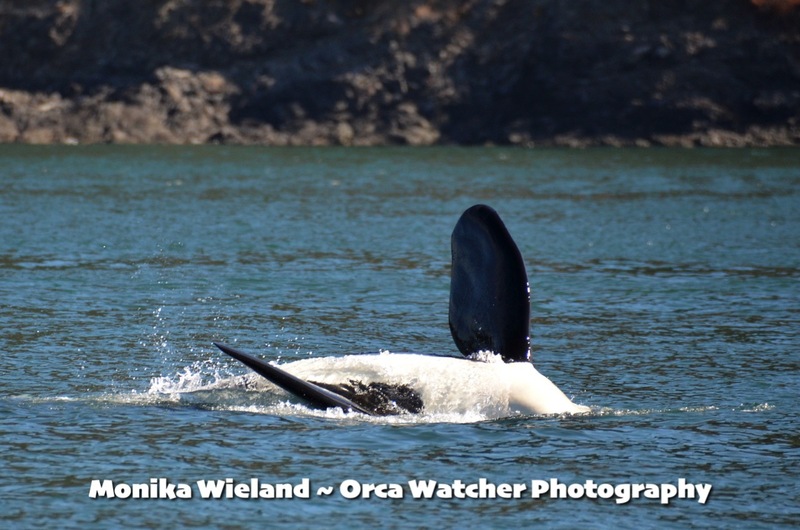 K20 Spock was one of the whales we saw actively foraging, but she took a moment out of her day to roll at the surface and wave her fins in the air while upside down! 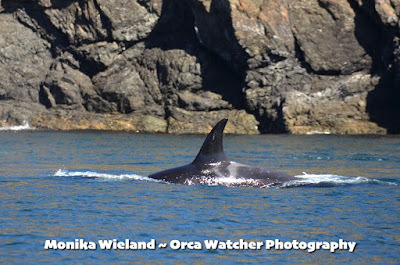 As we tried to make our way back to port we were forestalled by the whales grouping up in Open Bay. 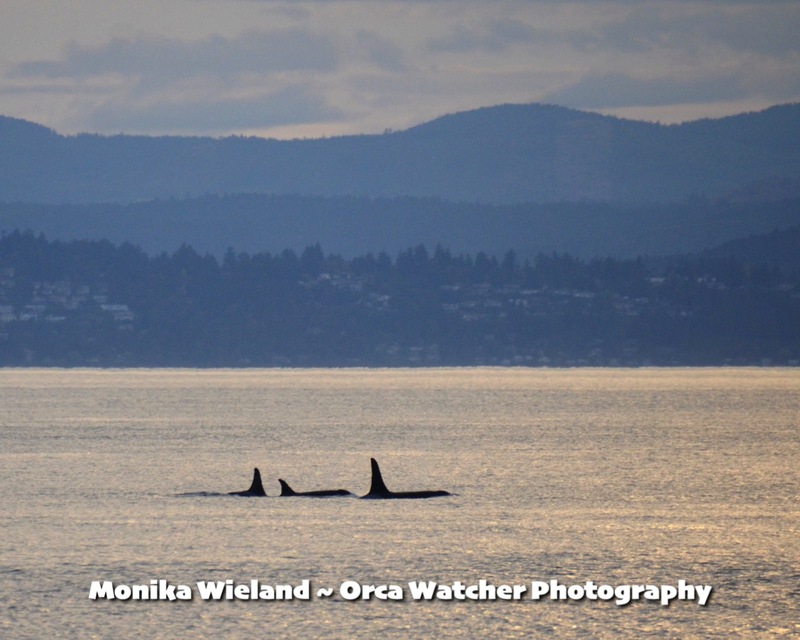 While waiting for them to pass, it was neat to see them all together again after having been so spread out for the previous hour. 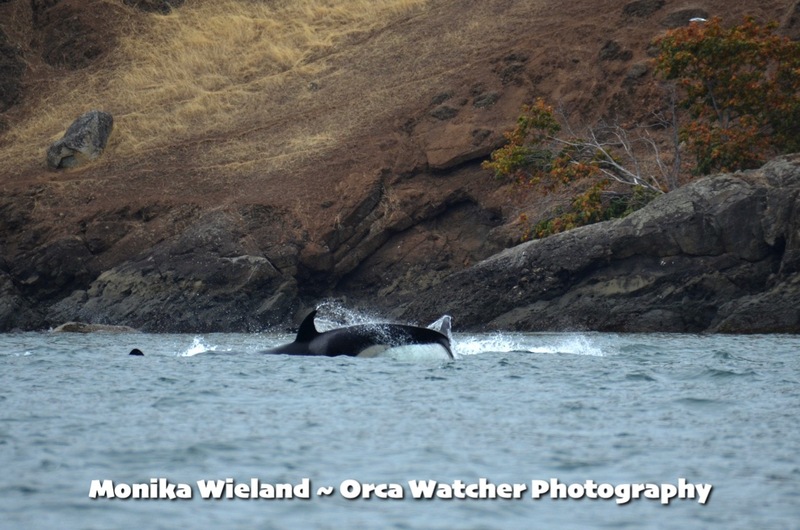 There was a lot of intermingling among whales from both J and K Pods, and apparently they were saying their goodbyes? 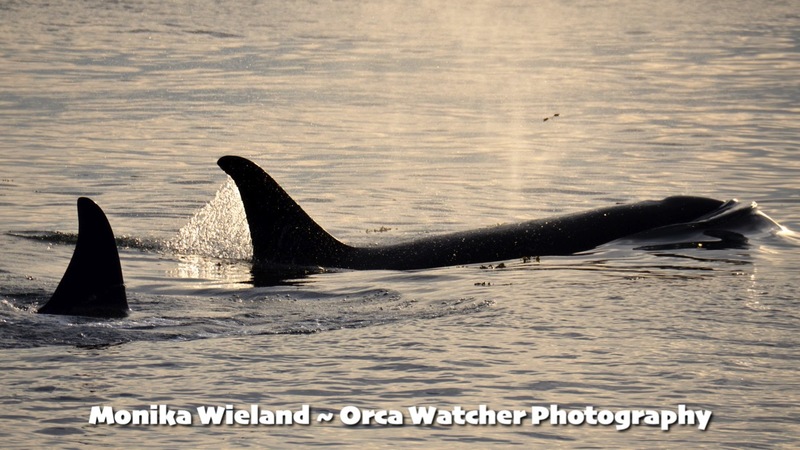 A bit later I heard K-Pod went back south, while J-Pod continued up to the Fraser River. 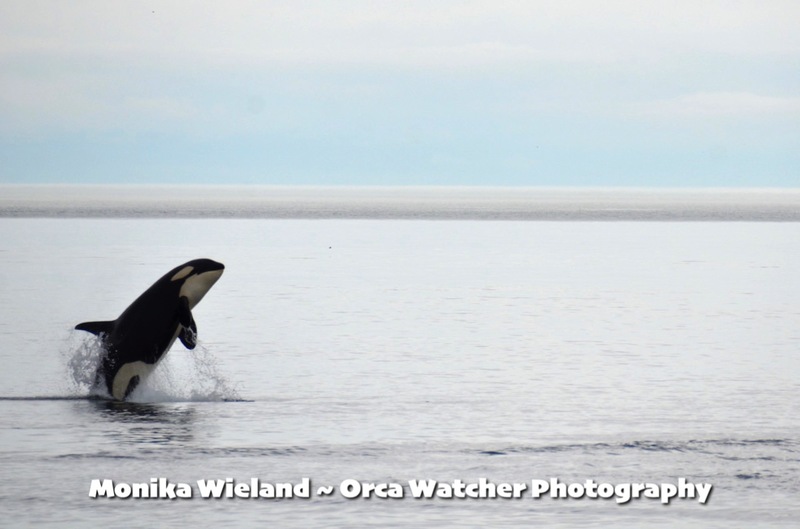 As we reach the back half of September, thoughts of a long, mostly whale-less winter loom ahead, so every whale encounter becomes extra special. You just don't know when it might be your last for the year! 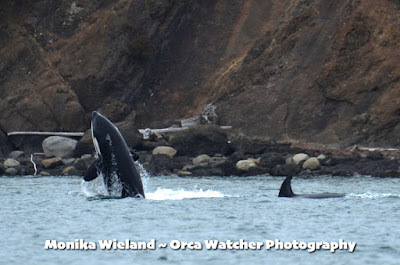 But I'm not ready to pack it in yet, as I'm hopeful for at least two more good weeks of "whale season"! 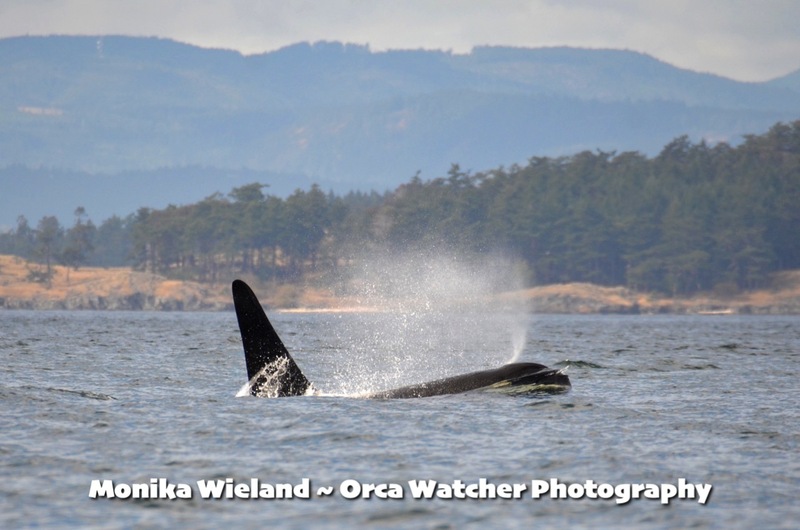 September 18-22: Whales Every Day!